Adam Daniel is my cousin. Half 2nd or 3rd something cousin, but related anyhow. There’s a lot of creators on that side in the family; musicians, conductor, Film people, TV Producer and a legendary Architect. But, Adam and I really did not know each other until this interview. So, starting this blog is also, apparently, bringing my family together. 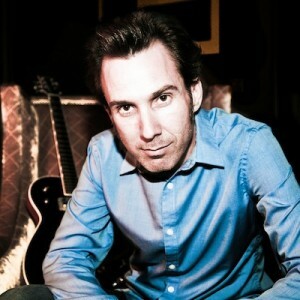 Adam Daniel is a songwriter, producer, and power pop recording artist. His new album “Pop, Baby” is a mashup of Elton John piano, fuzz guitars, Beach Boys vocal stacks, and new wave synth candy. All his favorite things.What is your songwriting/composing process? It’s fits and starts with me: I’m dry for months and then I write an album in a week. Songs usually start with piano or guitar noodling, then a vocal melody comes, then I start crafting lyrics. But then some songs just kind of come into my head all at once, fully formed. And some simmer for months before finally pulling together. So there’s clearly no rule to it. It’s chaos and patience. My one year old daughter screams and bounces in her seat every time she hears James Brown. Couldn’t be more proud. Otherwise, being fully DIY. I did my album myself on a laptop: writing, arranging, producing, performing, recording, mixing, and mastering. I also do my album art, web design, bio writing, videos, etc. I’m a little nuts. Insomnia helps. Obsessiveness helps. You had some songs in the George Clooney film “The Descendants” last year. How did that come about? I have an alt-country side project called The Flutterbies. A couple songs I wrote with the band’s singer Maureen Davis caught the attention of the film’s music supervisor, Dondi Bastone. Maureen met him years ago and kept in regular touch, sending him new recordings, etc. Our songs “Hummingbird Heart” and “Faith in Rain” reached him while he was working on The Descendants, and he thought they fit perfectly as background to the big confrontation scene toward the end of the film. By someone else, the opening lines of “Stars” by Grace Potter and The Nocturnals: “I lit a fire with the love you left behind, and it burned wild and crept up the mountainside.” Damn, I wish I’d written that. By me, probably these lines from the first verse of “Dream Out Loud” off my new record: “You’re like Salome when you dance in that veil, so say so and all the head you want is yours.” A sacrilegious pun in a power pop song. If you could sit down and talk songwriting with anyone, who would it be and why? Brian Wilson. The dude wrote “Vegetables.” I just wanna know what’s going on in there. Here’s a good rule of thumb: You’ll know you’ve written a standout when it sounds great sang in any style: metal, disco, reggae, jazz, polka, whatever. The best songs hold up no matter the production. Try it in your head with one of your favorite hits. Fun at parties. I truly appreciate everyone that has stopped by, talked about this blog and/or shared with friends. Please continue to share this page and site with fellow music lovers. This entry was posted in Interviews and tagged Adam Daniel, Brian Wilson, Cousin, Interviews, Los Angeles, Lyrics, Music, Power Pop, Songwriter, Songwriting. Bookmark the permalink.